In the original trilogy starring Paksenarrion Dorthansdotter, headstrong daughter of a farmer on the north edge of the kingdom, Paks follows her dream of becoming a hero out of legend by running away to join the army. Military life and warfare aren't anything like she imagined - yet she holds to both her duty and her dreams. Sheepfarmer's Daughter, Divided Allegiance, and Oath of Gold tell of her rise to become the paladin who saves a kingdom. In this new trilogy, Paks's former comrades in Duke Phelan's Company assume new roles and the story turns to follow their adventures. Thanks to Paks's courage and sacrifice, the long-vanished heir to the half-elven kingdom of Lyonya has been revealed as Kieri Phelan, a formidable mercenary captain who earned a title - and enemies - in the neighboring kingdom of Tsaia. Now, as Kieri ascends a throne he never sought, he must come to terms with his own half-elven heritage while protecting his new kingdom from his old enemies - and those he has not yet discovered. Meanwhile, in Tsaia, Prince Mikeli prepares for his own coronation. But when an assassination attempt nearly succeeds, Mikeli suddenly faces the threat of a coup. Acting swiftly, Mikeli strikes at the powerful family behind the attack: the Verrakaien, magelords possessing ancient sorcery, steeped in death and evil. Mikeli's survival - and that of Tsaia - depend on the only Verrakai whose magery is not tainted with innocent blood. Two kings stand at a pivotal point in the history of their world. For dark forces are gathering against them, knit in a secret conspiracy more sinister - and far more ancient - than they can imagine. 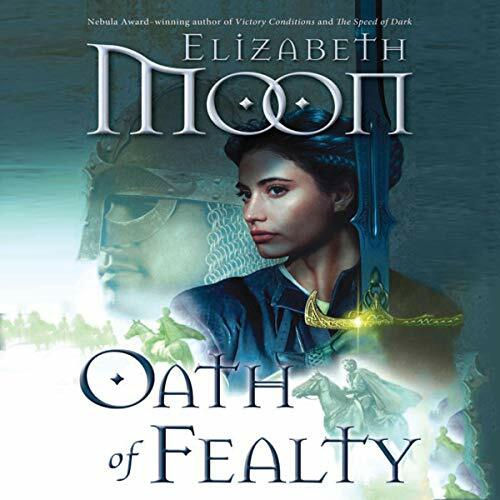 ©2010 Elizabeth Moon (P)2010 Brilliance Audio, Inc.
Paks plays a cameo in this first book of a trilogy sequel to The Deed Of Paksenarrion, but there is nothing lost in the new focus. The reader is treated to more of the same in the DOP - moral courage, personal challenge, physical trauma and other fare of good fantasy. The book reads well and smoothly. Moon spends sufficient time with each of her three main characters before moving on to the next. I found Moon's character development more detailed and nuanced than I found in the DOP. Of course, DOP was written in the late 80's and OOF was written just recently. I would recommend this book to any Moon fan and to people who like a good, fast read. I found the reading quite workmanlike and enjoyable. Van Dyke is a good choice for narrator, decently talented with several voices. I was disappointed to come to the end...not because it ended badly but because it ended at all. Have to wait another year or so for the next. What's the series title, anyway? Fantastic Sequel to The Deed Of Paksenarrion!! Found this follow up to DOP to be thoroughly enjoyable. It DOES help to have read the original Paksenarrion trilogy since this story is about several of the characters that were in the first series. While this is not about Paks, I found it just as engaging. Elizabeth Moon is an incredible story teller. Also Jennifer Van Dyck knocks it out of the park again. Very soothing to listen to for a long time. She is easy to understand and has a comfortable pacing, with a variety of character voices that at times sounds like a full cast audio production. If you loved DOP, I think you will be well pleased with this one!! Hope there is more to come. I read the first series of the Paks books when they came out and was thoroughly taken with them. Looking back, the facet of the books which really delighted me was Moon's facility for describing military life in a pikes, shields and swords setting, both the action sequences and the forging of a unit of warriors who depended upon one another at a completely visceral level for survival. She created a richly detailed and textured martial world which was completely believable and gave it to us from the intimate viewpoint of a new recruit. Also, Paks' rise to glory in those books was always rooted in the mud, blood and sheep manure from which she sprang, and that was really unique and very interesting, Especially since Moon also has an insightful voice when it comes to human motivations and ambiguities. Even the magic was gritty with a common touch. Holy Gird's roots were earthy and had as much to do with sweat as holy water. I found this extension of the original story a good deal less interesting or compelling. Moon still writes characters I can believe, and they still rise from humble beginnings, but those origins are so far in their past now as to generate little vitality. In addition, there is a lot more politics than action in this book, all nicely constructed from the viewpoint of plot, but not much of it was unusual or gripping, at least for me. Perhaps the fact that the book is split between the stories of two different rising stars and never unites the two threads, or the fact that it all ends very much in the middle of things and leaves the rest for another installment, kept it from being as satisfying as the earlier books. This and the two others to follow will have big shoes to fill when it comes to following up the previous three books. And while reading the first three books isn't necessary it provides a lot of background to the story presented. My only real issue with the book (and it might ahve been the narrator) was the Arcolin/Phaelan bits seemed... stilted. I wish there had been more Dorrin as her parts seemed to be rushed somehwat. Overall though I enjoyed this and look forward to the next book which isn't out until 2011. This novel kicks off the 2nd series. Jennifer Van Dyck is great as usual in her narration. Characters are easily distinguished and the pacing is great. My primary issue is while the first series focused on a primary character, this new series focuses on many characters. I normally has no problem with that structure if the author plays out each fully. While the plotline is great, as usual from Elizabeth Moon, I wish each character's story line was explored more fully and in the same kind of detail she used so wonderfully in the first series. This is the follow up series to the Sheep Farmers Daughter trilogy. This series stands up on it's own without listening to the Sheep Farmers Daughter trilogy, but I highly recommend listening to it first. This series is about the lives of people who were minor characters in the Sheep Farmers Daughter series rather than the life of Paksenarrion. I really enjoyed this series as much as I did in the Sheep Farmers Daughter series. I highly recommend it. I guess for some people this would be a fair book, but it wasn't for me. Some of it is in English and some of it is in some kind of homemade language that I can only guess the author made up as she went. After that, it seems to follow some vague story line about some royal people that start killing everyone like it was a medieval murder mystery. Good book and great narrator. Kate Reading and Jennifer van Dyck are wonderful narrators. Books 2 and 4 in this series have horrible narrators. The narration was often too fast. I prefer to savor a tale as it unfolds and found my enjoyment rapidly diminishing with the speed of delivery. Any characterization of the players was lost Finally just gave up and decided I would try a library book instead..
My favorite book. I have read it several times, I will read it several more. The previous book, The Deeds of Paksenarrion, is one of my all time favourite books, so I was delighted to have more in the same series. The fantasy world feels very real and the characters are solid and likeable. The narrator was well chosen, clear, pleasant to listen to and believable as the retired military main characters. Elizabeth Moon is known for capturing the feel of military life particularly well, including little details that give a strong sense of place and character. I'm just waiting for the next one in the series. Great story - but need the whole series! Would you listen to Oath of Fealty: Legend of Paksenarrion, Book 1 again? Why? Really great story - it's nice to have a follow up to the original trio, which I absolutely adored. The only problem I've found is that it's definitely not a stand-alone book. I will need to get the others just to find out the rest of the story! What was one of the most memorable moments of Oath of Fealty: Legend of Paksenarrion, Book 1? Certainly a book I would recommend, but it would be sensible to read/listen to the first trilogy in order to get a clearer picture of all the characters. I did do that, and therefore loved it! The story is excellent and works well even if you haven't read the previous series. The story is engaging from the start, and keeps your attention through the three main story threads. The Narrator is ok, but some of the voices are a bit off. It would be better just to stick to plain narration. For instance, whereas the elves in the series are clearly Norse/Tolkienen elves (similar to humans but taller, wiser and longer lived etc), she gives them voices like Santa Clause elves, as if they're tiny people. This is distracting when listening to scenes with elven characters in, and could have been avoided with a little research by the narrator. Having said this, you can get use to it and the story makes it worth while.